G.H. Cretors is a popcorn manufacturer, specializing in Chicago mix caramel corn. They've claim to have been making popcorn since 1885, and still follow small batch recipes. Of course, they are also up with the modern times, featuring non-GMO corn, no artificial colors or flavors, preservative free, gluten-free, and they use brown rice syrup for a sweetener (as opposed to corn syrup). Since I love popcorn, particularly caramel corn, I had to give it a try. "G.H. 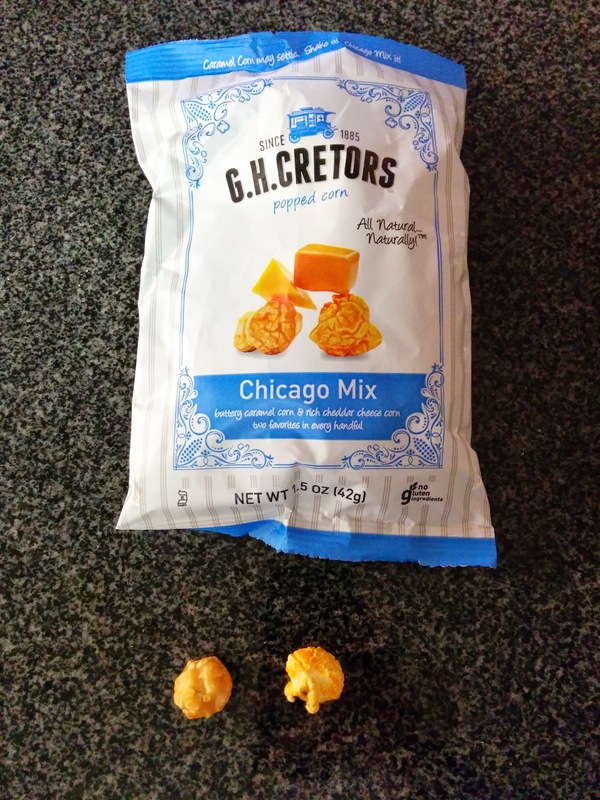 Cretors signature Chicago Mix combines caramel corn and cheese corn in the same bag." So, to be fair, this was my first time having Chicago Mix. I knew it was a thing. Cheesy popcorn and caramel corn, mixed together. I like sweet and salty mixes, so this sounded potentially good. But, it turns out, at least for me, cheese and caramel just do not mix. The cheesy popcorn was well coated, very cheddar-y. Good if you like cheddar popcorn. The caramel corn was crunchy, sweet, and had a deep enough caramel flavor. Also really well coated. But together? Cheese? Caramel? What? I just couldn't get behind it. I separated out my two flavors, and then realized that I just don't really like cheesy popcorn that much, so I gave the cheesy corn to Ojan, and ate the caramel corn on its own. I did enjoy the caramel corn. Of course, G.H. Cretors must have realized there are people like me, and my counterparts who like the cheese flavor only, so they also offer popcorn in "Just the Cheese" or "Just the Caramel Corn" flavors. Almost a year ago, I wrote a review of my experience at a group private dining event at Wayfare Tavern. The food wasn't remarkable, but, it was group dining, and, more importantly, it was before the latest executive chef took over. Of course, Tyler Florence is still the big name everyone associates with Wayfare Tavern, but the Executive Chef these days is Joey Elenterio. You may remember his name from a previous post of mine: my absolute top meal of 2012, at Chez TJ, when he was the chef there. I have such found memories of that meal, and was delighted when I heard that Chef Joey would be taking over at Wayfare Tavern, since it is in San Francisco, rather than Mountain View. I still haven't actually been for a proper meal at Wayfare Tavern, but I did stop in to pick up a few items for takeout. I was impressed that I could order basically anything from the menu for takeout, so many places do not allow this. Sure, I was warned that the plating would suffer, but they had no problem with me doing it. I ordered at the bar, and chilled there while I waited. The bartender was friendly, the atmosphere comfortable, and I quite enjoyed my wait for my food, and not only because I decided to treat myself to a cocktail! I really must get to Wayfare Tavern for a real meal! While I waited for my takeout order, I decided to treat myself to a cocktail at the bar. 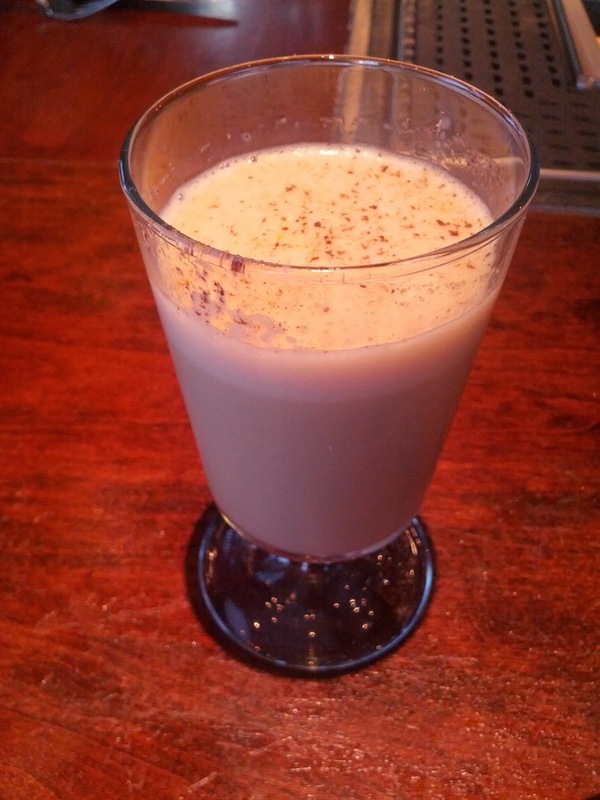 I was feeling particularly seasonally inspired, and went for the Spiced Pumpkin Nog: "spiced rum, pumpkin syrup, averna". This was an impressive drink, even before I tasted it. It is hard to see in this photo, but it had a nice cap of foam on top, visually appealing. The aroma the nutmeg sprinkled on top gave off was lovely. I wanted to just sit there smelling my cocktail, rather than drinking it. But drink it I did. It was a bit eggy. Nice and frothy. I'm not sure it really had any dairy in it, besides the egg. I somewhat expected more classic milk based nog, but this didn't seem to be. It was far lighter. Seasonal, flavorful, interesting. I probably wouldn't get it again, but I was happy to try it. $11 for a well crafted cocktail was fine. Chicken Liver Pâté: Saba balsamic jelly, arugula. $10. The reason I wanted this so badly is that some of my fondest foie gras memories are from my meal when the chef was at Chez TJ. I knew that he knows how to do liver well, and in particular, how to do mousses (he even sent me home with some foie mousse on that visit!) How could I not get another one of his liver creations? It was served with toasted crostini, which were hot and fresh when I picked it up, but obviously cooled off by the time I got it home. I didn't care, I wasn't in it for the bread anyway. The flavor of the pâté wasn't all that strong, and I think that people who say they don't like liver could even enjoy this. Of course, for me, I would have liked it stronger, and with less cream to mask the flavor. But the said, the consistency was perfect. So creamy. On top of the pâté was a layer of saba jelly. This was stunning. I love saba in general and had been using it on just about everything (I had a basil plant growing out of control, so as tomato season wound down, heirloom tomatoes and fresh basil drizzled with saba and olive oil were a daily occurrence in my household). The jelly was a perfect sweet component against the pâté. But, even better was the saba jelly, was the arugula! I know, the greens shouldn't really be the most exciting thing here, and no one else probably even noticed them, but for me, they really completed the whole dish. Fresh, crispy, and intensely peppery! I'm not sure I've ever had arugula with that much spice to it. 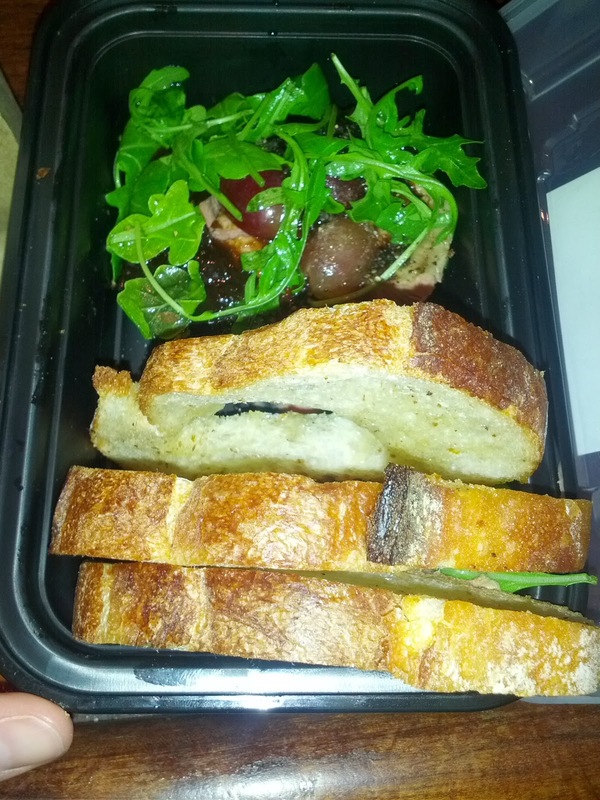 I loved it, and the strong spiciness of the arugula and the sweetness of the saba jelly were just perfect together. There were also some sliced grapes, another sweet component that worked well with the arugula. A good dish, and I'm sure when it is presented properly, a stunning one too :) For only $10, it was a generous portion, and a far more refined creation than I was expecting. I'd get this again. I can't wait to keep trying more of Chef Joey's liver dishes, and, hopefully someday, another foie one. Deviled Eggs: bread & butter pickle, green tabasco, celery. $11/6. Now, I have a long history with deviled eggs. They are something I've always enjoyed, long before they became trendy in San Francisco. When I was in college, they were just about the only thing I could find to eat in my dining hall at lunch. Not that they SERVED deviled eggs, but they had whole hard boiled eggs in the salad bar. And mayo, mustard, and pickles in the sandwich bar. So ... I'd get the eggs, peel them, cut them in half, mix up my filling, stuff it back in, and eat my deviled eggs. Yes, people thought I was crazy, I'm sure. But I enjoyed them. Daily. Anyway, after college, I didn't have deviled eggs for a while. But since the deviled egg trend hit San Francisco in full force, they started popping up all over town, generally done up in sophisticated ways. I've gotten back into trying deviled eggs, but usually, I think they are good, but I haven't had any wow me. I think this is just one area where I've had far too many of my own deviled eggs to really be able to like someone else's as much. They were my thing!!! A single order consists of 6 egg halves, so pictured here is a double order. They worked fine for takeout, except for the fact that they are uh, a bit slippery, and slid all around in the box, resulting in most of them toppling over during transit. Whoops! 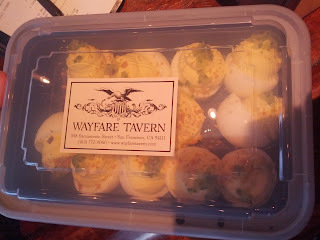 If takeout deviled eggs become a "thing", I think they totally need to come up with a carry case for them, a disposable version of those ridiculous tupperware deviled egg carriers? Close up of a deviled egg. The eggs were cut in half the other direction from how I do it. I always cut down the long side. I know this is just a preference thing, but I really like them cut the other way! The moment I felt myself caring about this, I realized I was in for trouble. There is just no way for me to enjoy other people's deviled eggs, I have too many preferences. 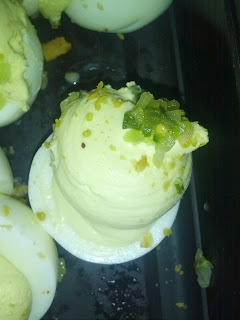 I liked the salt level of the filling, and the crunch of the pickles on top, but, they just weren't my deviled eggs. They were fine, but I wouldn't get them again. On my recent business trip to Tokyo, I organized a bunch of meals with my fellow visiting coworkers, mostly at Michelin starred establishments (spanning from fancy French cuisine, to Japanese tapenyaki, to sushi). But our hosts also took us out to experience more normal Japanese cuisine. We went to BeeHive for lunch one day for mediocre ramen, and to President Chibo for okonomoyaki, that left three of us with food poisoning. When we were asked what else we'd like to experience, we clearly said sushi, so one night, we went to a large group dinner. Since our budget was limited, they selected a sushi restaurant located in the same building as our office, Sushi Seizan. We had a large table on the side, semi-private. Service wasn't very attentive, but we also didn't really need much. Since we were a large group, our hosts arranged the menu ahead of time, a 10 piece nigiri plate per person. Most of it was no different from what I could get at a grocery store in the US (the only exception being the stellar uni). I wish I knew the price, because the sushi was so mediocre that I really hope it wasn't expensive. 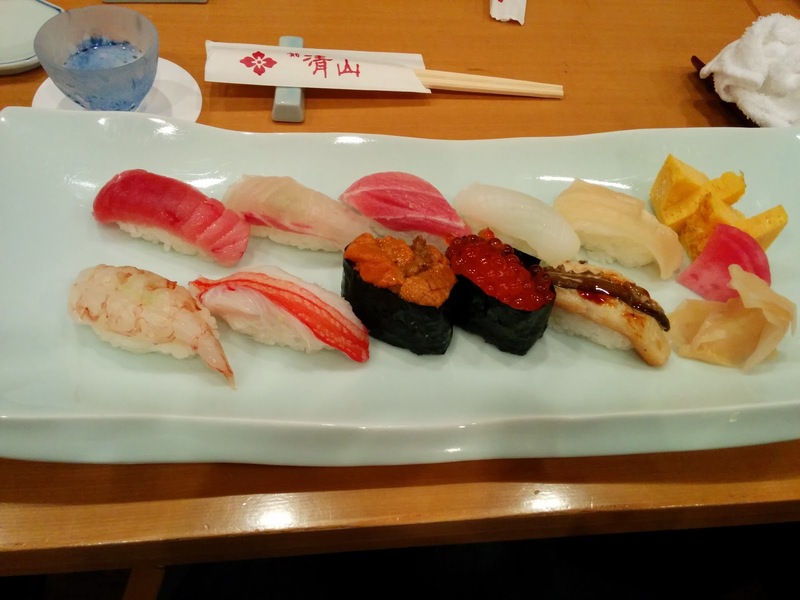 (Don't worry, we'd have good sushi at Michelin starred Sushi Kanesaka a few days later). The serving style was quire odd, as they brought out the dishes, each designed for a single person, rather slowly, and often one at a time. I can't imagine they were preparing them as they went, so it was a bit strange how long it took to serve us all. They also didn't seem to serve in any order that made sense, not serving women first, or starting at one end and working their way down. Random, and very slow. Anyway, it was nice to get out and have a meal with our larger group, it was easy to get to, and the semi-private area was perfect for allowing us to talk easily as a group, but I certainly would not return for the sushi itself. Maguro (tuna): Flavorless, 7th pick out of 11 pieces. Hamachi? : I wasn't entirely sure what this was, I think hamachi. It was very plain, no flavor, 8th pick. Toro (tuna belly): Stringy, remarkably bad. Toro shouldn't be bad! Least favorite. Ika (squid): Fairly standard, not offensive but not particularly good, 4th pick. Hotate (scallop): Mild and sweet, my second favorite. Tamago (egg): I always love tamago, and use it for my "dessert" with sushi, but this was just ok, pretty unremarkable, still, my third pick overall. Ebi (shrimp): Very standard and unremarkable, 6th pick only because I REALLY didn't like anyway I ranked lower than this. Kani (crab): Very standard, a bit stringy, 5th pick because it didn't insult me, but I wouldn't want another. Uni (sea urchin): The uni really didn't look good. It was strangely colored and just kinda lumped into the nori. But I love uni, so I dug in anyway. I was shocked: the flavor was good, and it was really, really creamy. Not only was this my first pick, and radically better than anything else in the meal, but it was so good that I'd go out of my way for it. One of my co-workers didn't want his piece, so I gladly helped him out with it. I wonder if I just really prefer Hokkaido uni to what I'm accustomed to in California? Ikura (salmon roe): I never like ikura, and it was pretty standard. Second to last pick, but mostly due to personal preference. Unagi (freshwater eel): Not as bbq'ed as I'm used to in the US, less sauce, less cooked. Third to last pick, as it was slimy and unappetizing. 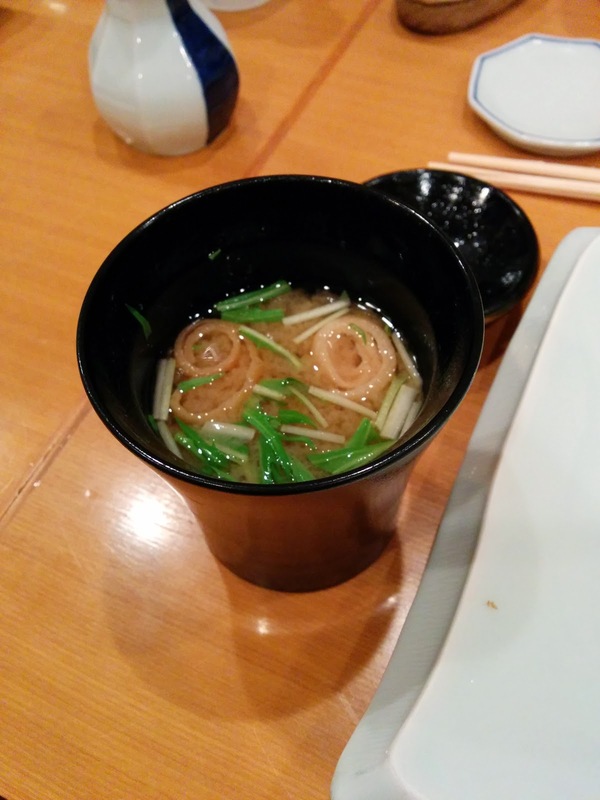 The miso soup was served after the meal, which seemed odd to me, but perhaps that is normal in Japan? It wasn't very good, the fried tofu skin was really, really soggy. After a fairly disappointing meal, I was obviously looking forward to dessert. 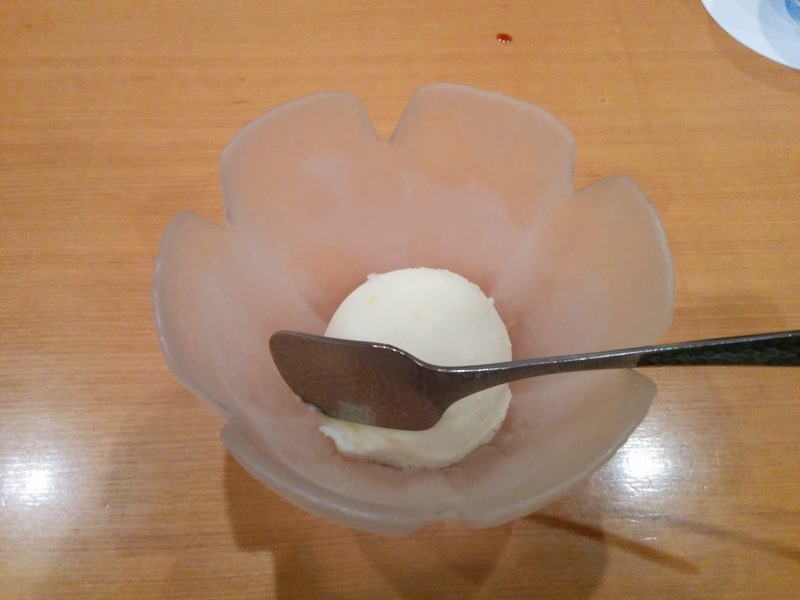 We were each served a tiny little scoop of ice cream, yuzu flavored. I was sad at first when I saw how small the scoop was, but, it turned out I didn't even want to finish the scoop I was given. It was more like sorbet than ice cream, in that it wasn't at all creamy, and was really icy. Really, really not good. I went out for dessert elsewhere after. Stay tuned for that review! I recently visited the island of Mallorca, off the coast of Barcelona, for a few days. My primary goal there was simple: to relax. And relax I did, staying in a gorgeous villa right on the beach with a group of co-workers and friends. But of course, I am a foodie, and no trip is complete without some fabulous dining. Mallorca actually has 5 restaurants each with a Michelin star, and it is no coincidence that we wound up staying just down the street from one of them, Jardín. The Jardín restaurant group includes three establishments: the Michelin starred main restaurant, a more casual bistro located downstairs from the flagship restaurant called Bistró del Jardín, and a even more casual establishment, Danny's gastrobar, located next door. Bistró del Jardín serves some of the most famous dishes from Restaurante Jardín, while the gastrobar serves tapas and burgers. If we had been on the island longer, I would have liked to check out the casual places too, but since we had a limited time, we went just for the main restaurant, for lunch, on our very first day. Jardín serves traditional Mallorcan dishes, except, with a twist. Because I was on vacation, I didn't have time to write up my review immediately, but of course took copious notes. I apologize for brevity, as this will not be as thorough as usual. The meal, 12 courses, took several hours, but it was the perfect way to slowly ease into our time on the island, and was quite a success. Of the 9 savory courses, 7 of them I'd gladly eat again, and 5 of them I would really, really like to have again. The top 5 were all absolutely incredible. For a large tasting menu where I didn't get to pick any of the dishes, this is a very high success rate! The entire meal was quite memorable, not only due to the incredible taste of the food and the unique ingredients we got to experience, but also for the stunning plating and presentation throughout, and the elements of surprise thrown in, as you'll see below. I also really appreciated the education aspects of the meal, and getting to experience so many local products, yet in a highly refined way. We arrived 15 minutes early for our 1:30 reservation, to discover that the restaurant does not actually open until 1:30pm, so we couldn't be seated early. Instead, we were invited to sit inside the casual bistro area, to have a drink first. Since Emil was on this trip, he started us off in style, with a bottle of champagne (Veuve Cliqquot-Ponsardin Tellow Label) to start. A few minutes after our champagne was poured, we were presented with tapas: fried balls. They were clearly ridiculously hot and fresh, direct from the frier. We were told that they were filled with jamón (ham), but, we didn't really taste ham. They sorta seemed like fried balls of gravy. I appreciated the snack while we waited, and the freshness, but, since we were about to have a 12 course meal, I didn't feel compelled to have a second one. At 1:30, our host came back to get us, and instructed us to get in the elevator. We crammed ourselves in, our group of 7 completely filling it. Perhaps we should have broken into two groups. By the time we got up to the restaurant, our host was there waiting for us. It was almost like a magic trick, and he laughed as we got out of the elevator and saw him in surprise. He also had our champagne bottle waiting for us! Getting led to our table. We were lead through the restaurant to the back, a semi-private area. We were seated at a big round table. The decor was modern and swanky, with bold artwork on the walls. The centerpiece was quite interesting, made from assorted silverware. Classic table settings included a white tablecloth and cloth napkins. The ladies were all given purse hooks with the Jardin logo on them to use during the meal, and then, at the end, they put them into little bags for us to take home. Souvenirs! The knives we'd receive throughout the meal also had the logo on them. Service throughout was good, as you would expect at a starred establishment. The ladies were always served first, in unison. Crumbs were cleared off the table. Silverware replaced between courses. The wine list was housed in a beautiful cork binder, made from a slab of virgin cork. I'm not all that knowledgeable about wine, but Emil says the list was as impressive as its cover. Lo Cortinel.Lo, 2012, D.O. Pla i Llevant. Rather than selecting our own wines, we agreed to let the sommelier just select bottles for us to pair with our meal, switching to a new bottle whenever appropriate. We started with this white wine, which I found quite refreshing, not too sweet nor too dry, a good start. 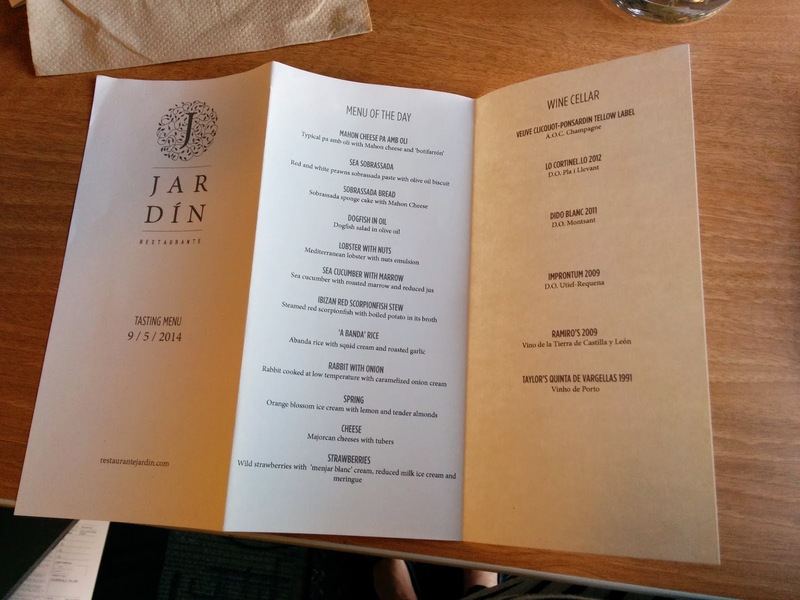 Jardin has only one option, a 12 course tasting menu, for 93.50€. The menu was presented as a list of main ingredients, one for each course, on graph paper. The paper was attached, via paperclip, to a booklet containing information about Mallorca. We were told that we'd receive the full menu at the end. I of course looked up the "menu" in advance, so I had asked to substitute out the rabbit for myself, since, I've had many bunnies as pets, and I just can't bring myself to eat rabbit. At the end of the meal, as promised, we received printed copies of a slightly more informative menu, complete with our wine selections. I'll include these details in the reviews below, but I didn't have this information at the time I was tasting the dishes. Botifarró is a pork sausage, specific to Mallorca. But, what was this? It clearly wasn't just a sausage. Our final menu said "mahon cheese pa amb oli: typical pa amb oli with Mahon cheese and botifarró." Pa amb oli is a very traditional Mallorcan dish, which literally means "bread with oil". The bread here was two little pita breads, perched on top of a casserole dish, one topped with what was presumably the botifarró, one topped with Mahon cheese (a local cheese). We had no idea what we were in for when it came to these. I thought they were just pita with toppings. I thought very, very wrong. The pita was super crunchy, and the inside held a big surprise: tomato and olive oil! One of my dining companions described the experience of biting into it as "an explosion of happiness". I agreed, the filling was intensely flavorful, and totally delicious. Another commented, "how do they even make that? It is like a magic trick!" The cheese was salty and firm, and the botifarró, well sausage-y. This was an amazing way to start the meal, with surprise and delight. We all then eagerly opened the casserole, to find it empty, used only for plating. This set the tone for the amazing plating throughout, including beautiful garnishing and interesting serving pieces. Of the 9 savory dishes, this was very middle of the road for me, Emil and I both ranked it 5th, but it was still very, very good. There were just better things coming! Three of my dining companions ranked it their #2 dish, and the last ranked it #3, so we all scored it in the top half of the meal. Next came this dish, with what looked like a meat based spread, and two crackers, served on a beautiful wooden board, with a knife for spreading. Again, stunning presentation. But the menu said "prawn", so we assumed that we had skipped ahead to the next dish listed, sobrasadda. Sobrassada is a pork sausage, native to the Balearic Islands. Then, the dish was described to us verbally as "sea sobrassada". Surprise! The final menu told us that this was "red and white prawn sobrassada pate with olive oil biscuits". Aha! The sea sobrassada certainly had the texture of a regular sausage, but contained no pork, rather, it was made from the two types of prawns. I have a hard time describing what it tasted like, other than the fact that I really, really didn't like it. Nor did anyone else in the group. On the side were biscuits that looked fluffy, like bread, but instead were very crisp, another surprise. I appreciated this dish for the surprise aspects, and the play on sobrassada, but I didn't really want more than a couple bites. My least favorite of the savory courses. Four others ranked it second to last, and the other two ranked it third least favorite, so clearly, not a winning dish for any of us. We were also presented with 2 full sausages, laid out in the middle of the table, just so we could see the full form. Next came the dish listed as sobrassada. Of course, it didn't look anything like sausage, because instead it was a cake, "sobrassada sponge cake with Mahon cheese". And again, the presentation was stunning, served on top of a slice of a tree trunk. It was a very fluffy sponge cake, made with corn flour, and, yup, sobrassada. It was topped with shaved Mahon cheese, you guessed it, a local cheese. This dish was pretty amazing. The cake was incredibly light and fluffy, yet, intensely sausage-y at the same time. The sausage inside was quite spicy. The cheese on top was salty and delicate. So much unexpected flavor in here. I loved the play between this dish and the previous one. The previous one looked like sobbrasda, yet tasted nothing like it. This one, didn't look anything like it, yet the flavor was unmistakable. Such a fun dish, and, unlike the previous, quite tasty! This dish had very mixed reviews. Both Emil and I ranked it our third pick, and one person ranked it number two, but another ranked it 4th, another 5th, and two others had it in their bottom three. Dido Blanc 2001, D.O. Montsant. My notes only read one thing about our next wine, that it was "bold", as in, very bold for a white wine. I know we all seemed to enjoy it though. The final starter was a first for us all: dogfish. We had no idea what dogfish was, nor what to expect. Of course, at this point, we had learned not to expect anything. As it was placed in front of us, were were told it was "dogfish salad". Except, as you can clearly see, it was not a salad, but rather, a soup. Except, it really was a salad. But, a soup. Let me explain. The soup base was liquified lettuce. Yes, really. Hence, the "salad" aspect of it. The dogfish came in 3 chunks, cured. It was very firm, but otherwise, unremarkable. The dish was finished with olive oil, which imparted a pleasant nuttiness. Topped with slivers of lettuce, adding to the "salad" aspect. This was a very fun dish, quite playful. More places should make soup-salads! It was also the first dish actually served on normal dishware. Next up came the bread course. I'm not really a bread person, but I did appreciate that it was served warm, and was super crusty yet moist inside. No butter or oil were provided on the side. Next, the lobster dish: "mediterranean lobster with nuts emulsion", also served in a regular bowl. Now, I know everyone is always crazy about lobster. Not me. Not that I dislike it, but I find lobster very overrated. I prefer crab most of the time. This lobster however, was shockingly good. They said it was blanched, but it had a smokiness to it that was incredible. It was very nicely cooked. Also in the dish were fresh peas, just bared cooked, super tender and flavor. They tasted like spring ... you know, if spring had a taste. Finally, it was served on top of a macadamia cream. This was the only part of the dish that wasn't a success. It was really viscous, stringy, and really quite odd to eat. The flavor was fine, but, it was just really not enjoyable to consume. It didn't matter that the macadamia cream was a failure though, the lobster was so incredibly good, and I loved the brightness from the peas. One of my dining companions rated this his favorite dish of the night, Emil and I both said it was our second favorite of the night, while three others ranked it third, and the final person deemed it fifth. In the top half of the meal for everyone. I didn't take notes on the next wine, a sauvignon blanc, besides saying it was "ok". I guess I was pretty distracted at this point in the meal by the incredible food, and of course, my company. Next up was the sea cucumber dish, "sea cucumber with roasted marrow and reduced jus". Plating-wise, we were back to dishes served on wood. I'm pretty sure I've had sea cucumber at least once before, but, I don't recall ever really thinking much of it. This however was quite tasty. The sea cucumber wasn't at all slimy, which I somewhat expected. The texture was really nice. Like the lobster, it had a beautiful smokiness to it. The pieces of sea cucumber were flanked by a a chunk of turnip and a chunk of marrow, both roasted. I don't love turnips, but marrow added a very nice richness. There was also a light sauce, very salty. I loved it, but I could imagine it being too salty for those without a "chef's palette". Garnished with pretty little chive blossoms. This was the highest overall rated dish of the meal, hands down. All 6 of us who did not rate the lobster as #1 had this as our top pick (the lobster lover ranked this his 4th pick). While there were many memorable dishes from this meal, this is one we all kept talking about later, specifically for its incredible taste. Our final seafood offering was scorpionfish, which I'm pretty sure I've never had before. Described as "steamed red scorpionfish with boiled potato in broth". The fish was moist and meaty, not bad at all. Served over what was a potato puree, but tasted fishy. I kept trying it, trying to understand how my potatoes had such a strange flavor. It turns out, they were infused with a broth made from an upcoming dish, a shrimp paella. Another surprise. Perched atop the scorpionfish was a tiny piece of crispy skin. It was insanely crispy. I've had crispy skin before, but never anything like this. We all loved the crunchy skin, better than any chip you'll ever find! There was nothing wrong with this dish, but we were all coming down off our high from the sea cucumber and lobster, and, besides the crispy skin, this seemed fairly boring in comparison. It was Emil and two other's 6th pick, my and two other's 7th pick, and the final member ranked it second to last. While in my bottom 3, this was still fine, and I'd eat it again, it just wasn't a top pick. Ramiro's Vino de la Tierra de Castilla y Léon 2009. At this point, we moved on to red wine to go with our upcoming meat entrees. The sommelier selected a Tempranillo. My notes are brief, but say that it was quite nice, light, and not too tanic. It went well with the meal. To segue into the meat dishes, we had a rice dish, which was the second stage of the previous dish. The menu read "abanda rice with squid cream and roasted garlic." As I said, the potato puree was made with a shrimp broth, just like the upcoming paella. This was the paella. My research after the fact taught me that "a banda" or "abanda" means rice cooked in fish stock. The rice itself was very well cooked, nicely al dente. But it was cooked with the same fishy broth, like the sea sobrassada, that I really didn't like. On top was a very confusing component. It was an aioli, made from raw squid! The texture reminded me of lobster, a bit stringy. It was odd, for sure. It reminded me of cheese. I actually kinda liked it, but, the others really did not. It was recommended that we mix the aioli into the rice, but since I only liked the aioli, I just ate that part alone. Everyone but me really didn't like this. Three of my companions ranked this last, another second to last, another third last, another 6th. But I ranked it 4th, because I really, really liked the crazy squid aioli. The main dish was rabbit, which, given my history of owning bunnies, I skipped. The menu described it as "Rabbit: rabbit cooked at low temperature with caramelized onion cream". Everyone else had this dish, and reviews were varied: two people ranked it last, but one ranked it 4th, two ranked it 5th, and the final 6th. Sadly, my replacement for the rabbit was lamb, which, I don't really like. It had a really strange stringy texture. And well, it was lamb. I gladly gave it away to one of my dining companions. Its not like I was hungry at this point, and we still had desserts to come! It was served over caramelized shallots, which I really did love. I mean, it is hard to go wrong with shallots, but these were really caramelized, perfectly salty, and in a delicious sauce. It was also served with a totally crazy flip out knife. My second to last pick of the meal, and I wouldn't want this again. Finally, time to start in on desserts. Or, pre-desserts really. First up, a dish that the first menu listed "orange blossom". When it was delivered to us, we were told that it was "spring". The menu said "orange blossom ice cream with lemon and tender almonds". The primary component was orange blossom ice cream, which was quite complex, and not just sweet. Served atop a orange biscuit crumble and a lemony foam, with shaved tender almonds and white blackberries on the side. The white blackberries were fascinating, sweet, honey-like. Overall there was a lot going on here. Something cold and creamy, something foamy, something crunchy, something soft. Along with our desserts, we also enjoyed a sweet, caramely port, Taylor's Quinta de Vargellas 1991. Next, what Emil would call a proper dessert: the cheese course. Another stunning serving dish, shaped like an artist's palette. The selection was 4 local cheeses, each served in pairs, one raw milk cheese, but the rest were goat. Even though I dislike goat cheese, I still tried the brie-like one, but it had a strange chalky texture that I did not care for. The dots on the palette were apple compote, which tasted just like apple sauce to me. I'm not really sure why I'd want apple sauce with my cheese, although, I guess cheese and apple pie can be a classic pairing. The final component on the platter were little pieces of carob sponge cake, which were quite bitter. Overall, certainly not a winning dish for me, mostly due to the cheese selection. However, it was served with a very interesting component, which I don't have a photo of: a shot glass filled with a sweet infusion. We were told to guess what it was. We guessed honey. Or honeysuckle. It was impossible to know what it was. In the end, after we exhausted all our guesses, we were told it was a date infusion. The last course was "strawberries", or, "wild strawberries with 'menjar blanc' cream, reduced milk ice cream, and meringue. There were two frozen components, one more creamy than the other, one more icy. I think the creamier one was the "menjar blanc" cream, a play on blancmange, and the icier one the reduced milk ice cream. There were also little meringues. And a random hard thing, that I couldn't identify. And a strawberry gelee. And, yes, the strawberries. This was a really fun play on strawberries and cream. I was incredibly stuffed at this point, yet cleared my plate, easily. Even Emil ranked this above the cheese platter. Unfortunately, I didn't really take further notes, as I was too busy enjoying it. My favorite of the desserts. To end the meal, we all opted for espresso. I went for decaf. Served with sugar, sugar cubes, and brown sugar cubes, with a cute little thin spoon. I didn't use any of the sweeteners. The decaf was fine, not remarkable. We really thought we were done, but of course, we couldn't forget the mignardises! Yet another beautiful presentation. Apple financier, topped with a dollop of apple cream. Better than most financiers, but, meh, just boring cake. "mine malda" is what my notes say, but I don't know what this was really called. Two crispy squares, like phyllo dough, with cream inside, and quince paste on top. Chocolate cookie, topped with a super creamy chocolate ganache. My notes say "vodka", but I honestly don't recall what I was referring to.